There is much I could write about from my experience this week at the National Title I conference. Before I possibly share what I learned from various sessions….I want to share the experience. I was invited to present with the National Center for Families Learning on Wonder and Inquiry Motivate At-Risk Students and Families. My role? To share a parents perspective. While there; I thought it only made sense to take in as much of the conference as possible. What kind of sessions did I participate in? Everything from Designing a School-Family Compact, to Literacy Instruction Through the Use of Mobile Technologies, to a session called Moving Targets, where a school shared their story of moving from a last place ranking by their state up to around the top 25%…in one year. First takeaway…ENERGY. If we want children to be excited about learning…the adults need to also exhibit excitement. The teachers and principals that I saw sharing their success stories were not just teaching their students – but I’m also sharing their excitement for learning. Before Jeff Charbonneau took the stage, the conference was kicked off with each of the schools recognized as a Title I Distinguished School stepping up on the stage and sharing with the thousands in the room what made their school special or what their motto was. These schools brought such energy, enthusiasm and pride, as they had every reason to be. The session I mentioned earlier, Moving Targets, how did they turn themselves around? Starting the day excited about the opportunity to make a difference, taking a honest look at themselves, stopped making excuses and doing whatever they needed to do to provide their students (or as the principal called them “her babies”) the education they deserved. Second….as someone mentioned to me this week, “Technology, they’re all using it.” Smartphones and tablets have given many access to the internet and social media; regardless of their economic status. So not only should sessions be talking about tools to use in a classroom between teacher and student – but there should also be discussion of how these tools can be used to take the learning home; outside of the school walls and in connecting families with the learning. If we want students and families to use technology and social media to enhance learning, I think it is also important for the schools to role model how to use it. I have been spoiled in that any education conferences I’ve have attended in the past are filled with educators using social media to share what they were learning throughout various sessions. Not only is it wonderful for those not in attendance (and that would include families following you/school account) – but for those wanting to be part of multiple sessions simultaneously. I’m not sure if it was the extremely limited wi-fi access at the venue, or if many of those in attendance simply don’t use social media. But sharing was almost non-existent (I pulled anything I could find from Twitter relating to this conference, and there were only a few of us tweeting out of around 3000 in attendance). 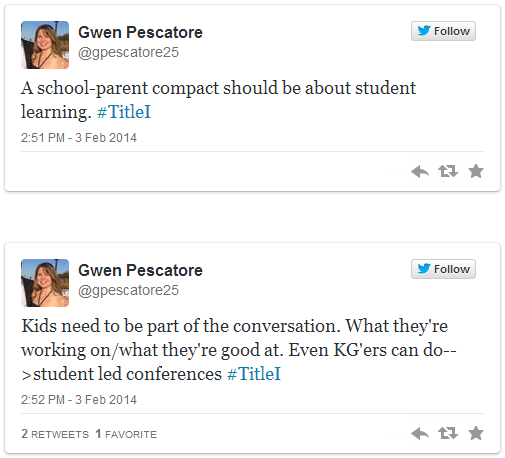 The @natltitleIconf last tweet…note the date – Oct 23! I don’t care how information is shared…but I do think they are missing something big by not sharing. The schools and people that fill them, that were in attendance are doing great things…what they are doing should be put out there as much as possible, so other schools with similar struggles can learn from them. Plus, there were many phenomenal sessions there that I think provided great information that families could use in supporting their student and schools. What a thrill it would have been for a parent at home to follow along with a session such as “Multiplying Vocabulary Using Manipulatives”? It doesn’t sound like a party…but for a parent unsure how to help their child who may be struggling; these tips could make a difference. Third…engaging families IN the process is a work in progress. This conference had more parents in attendance than most other educational conferences (meaning individuals not also considered educators), because of that and the fact that part of Title I encompasses family engagement, I expected far more sessions to share how to include families in these efforts, discussions, processes. The ones that did include them, did it well. But other sessions limited discussion to the admin and teacher. A few mentioned families as an, “oh, and be sure to have your families review this – or make sure to share a copy with your families,” but if you are doing what’s best for the students and you really want a full partnership between home and school…then you need to include families earlier on…not at the end as a “by the way, here is what we are doing.” Maybe this isn’t so much about tailoring the sessions as having voices in the sessions willing to share their ideas on how to incorporate the parents in the process. Either way, I think that this is an opportune time to provide tips to educators on best practices for engaging families during the processes and discussions….to help them build real home-school partnerships. Below is a tweet that I shared with two of our teachers not in attendance, but then I also shared them with a few parents I thought would appreciate using them from home. As always, I think anytime a parent has the chance to learn from and attend a educational conference, they should. There is so much to take away from these conferences. They not only help to educate and inform on various topics – but you can add a much needed balance to discussions and meet lots of amazing educators doing amazing things with students each and every school day (which for me brings a sense of respect for what my children’s teachers endure each day while still serving as an inspiration). For those not able to pay the larger fees of conferences such as the National Title I conference, I encourage you to seek out a local EdCamp (which are free and full of amazing educators to learn from and with).